Royal Caribbean has added a new three-night Ovation of the Seas itinerary sailing round-trip from Southampton on 14 April 2016 and calling at Rotterdam. The new itinerary went on sale on Thursday evening with prices starting from £249 per person. Current availability shows only Family Junior Suites remaining with prices starting from £619 per person. The three-night no-fly round-trip sailing on the latest Quantum-class ship includes a day at sea and a seven hour call into Rotterdam, the Netherlands. The sailing will also be a chance for passengers to experience the Royal Suite Class for the first time. This is Royal Caribbean’s new luxury offering that includes 24/7 service from the “Royal Genies”. The new itinerary is in addition to the two other European cruises already on sale, including a five night cruise to France and Belgium departing on 17 April, and a seven night cruise to France and Spain departing on 22 April. The ship will then embark on a 52 day “Global Odyssey” repositioning cruise to its new homeport in Tianjin, China. 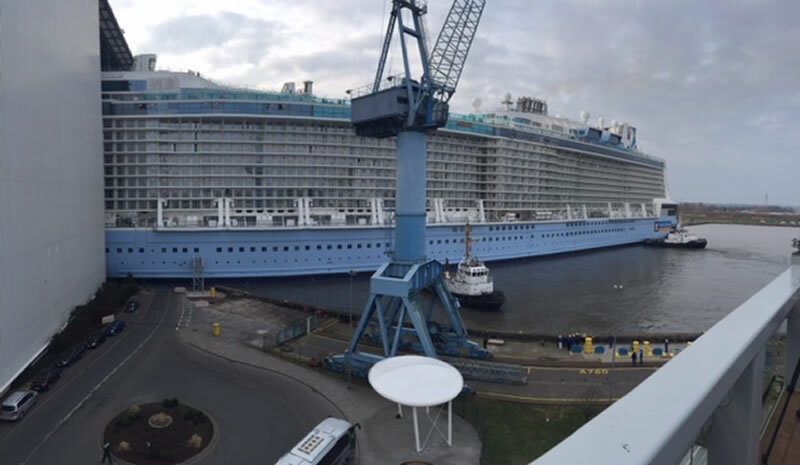 Last week also saw the float-out of Ovation of the Seas from the building shed at the Meyer Werft shipyard in Papenburg, Germany. The conveyance along the River Ems is scheduled to take place in March. Ovation of the Seas will be similar to sister-ships Quantum of the Seas and Anthem of the Seas and will boast a Bionic Bar, North Star, RipCord by iFly, SeaPlex, and 18 restaurants including Wonderland. It will also feature a new DreamWorks experience including character dining, appearances and photo opportunities with characters from Shrek, Kung Fu Panda and Madagascar as well as kids club, Adventure Ocean appearances and 3D movies in the on-board theatre. Like her sisters, Ovation of the Seas will feature a large scale animal on the upper deck. Previous art installations have been a polar bear and a giraffe. A spokesperson for Royal Caribbean remained tight-lipped when asked which animal will be next. Some have speculated it may be a gorilla or a panda bear to tie in with the recent partnership with WWF.